I keep having to steal time between ‘somewheres’ I’m supposed to be to work on the Fiat and I’m happy to report it has paid off. The bell housing bolts, starter bolts, solenoid and other stuff I was waiting for showed up and last weekend I got to spend a few of those stolen moments installing it all along with the intake manifold and fuel pump, which I had removed to get access to the starter. 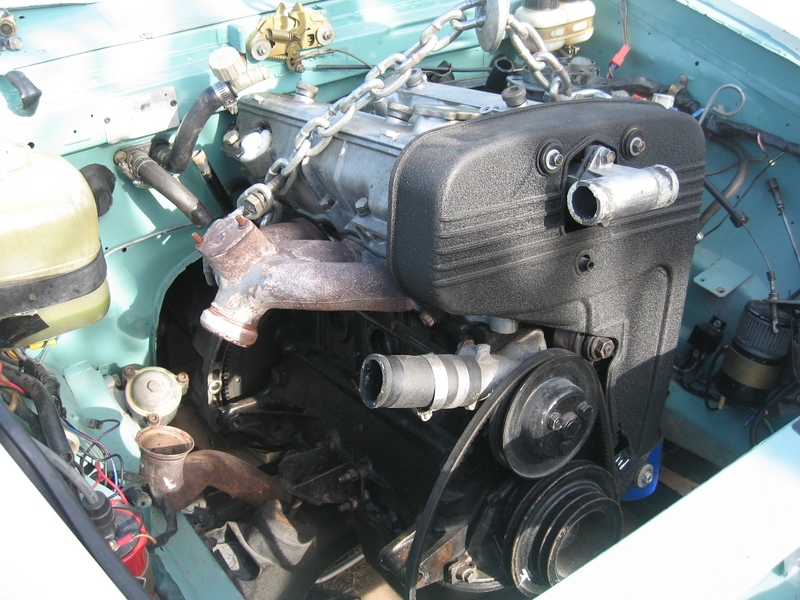 Way too much going on on the intake side of these Fiat twin cam engines! Sunday I left the shop having turned the engine over with the starter – v e r y s l o w l y I admit, but encouraging none-the-less. This is a picture from this morning, about 1 hour before I started writing this post. You will notice all sorts of funky stuff that I will go into later, but the important thing to take away from this picture is that it has the look of a car that runs. 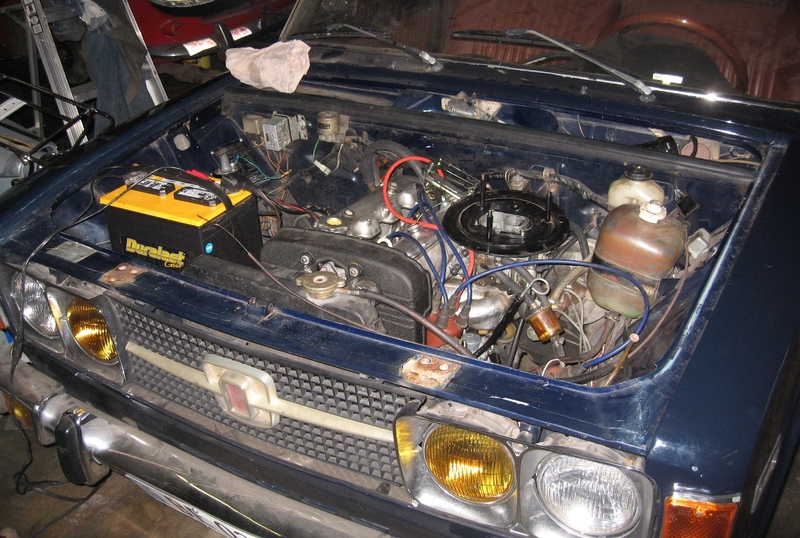 Fiat 124 sport sedan engine transplant is moving right along -and if the 69% hp increase all indications point to it seeing is realized, it will probably finally live up to the ‘Sport’ in its name. Fiat enthusiast Csaba Vandor in Texas came through with a big box of parts that I needed and Friday was the day I was set to start. As usual I didn’t have a detailed plan, or much of an idea of the hurdles I’d be jumping, but I knew that it took starting the race for the hurdles to appear. First step after the starting gun goes off? 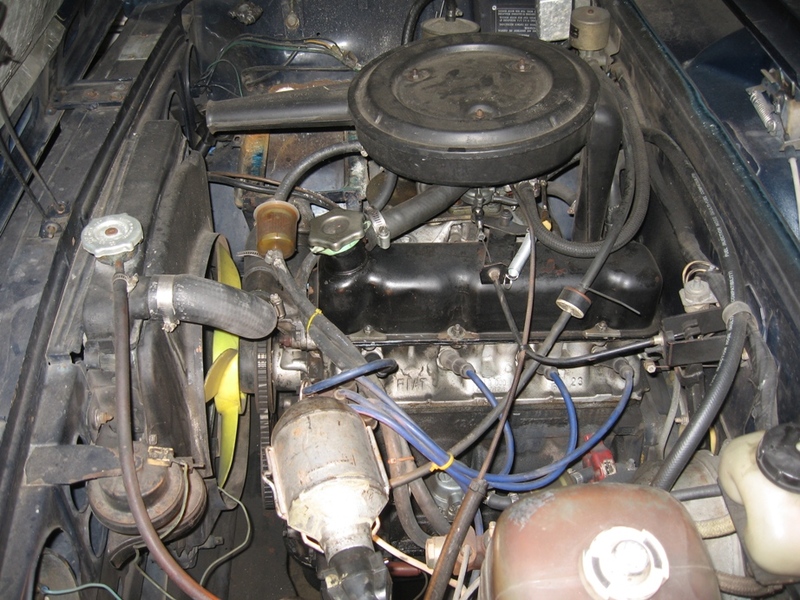 Remove the 1438 bell housing and install the twin cam bell housing. 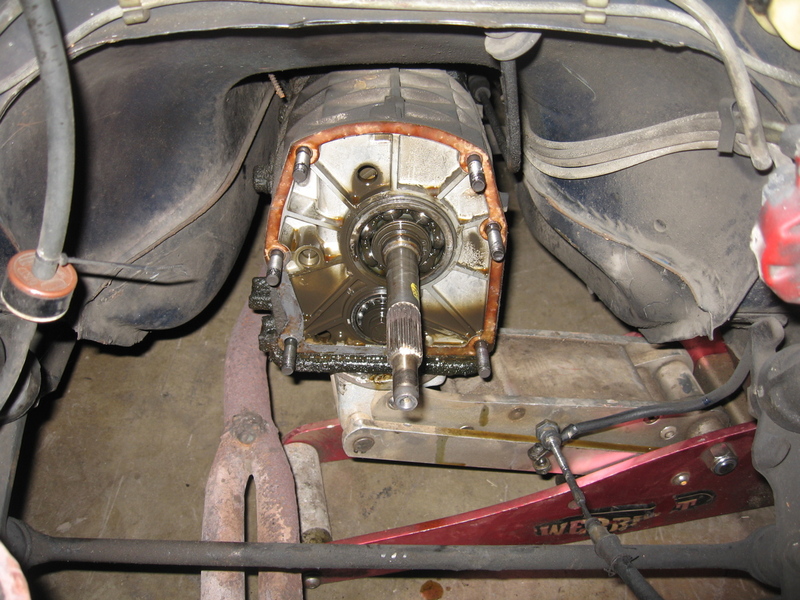 Here’s the transmission after I removed the 1438 bell housing. I was expecting the bell housing to put up a fight but it just came right off once the 7 nuts were removed. Sometimes I am reminded of how always in the Odyssey Athena with the frequently flashing eyes is giving help, good omens and occasional back rubs. Last Saturday (as in three days ago) I was at the ARA All Italian day in Alameda and what should I spy but a Fiat Spider with a note on the windshield saying something along the lines of “1800 Engine for sale, hear it run!” Well, the owner was on hand, I heard it run, monies to the tune of $250 were required to take ownership of said engine, with certain parts removal caveats of course, and I blinked twice, summoned my check book and bought it. Athena never showed, with flashing eyes, to have her maidens give me a rub down with finest oil, but things were definitely right in my pagan world. What led me to such extremes? Why the change of heart from a polish and go with a few new parts on the 1438? 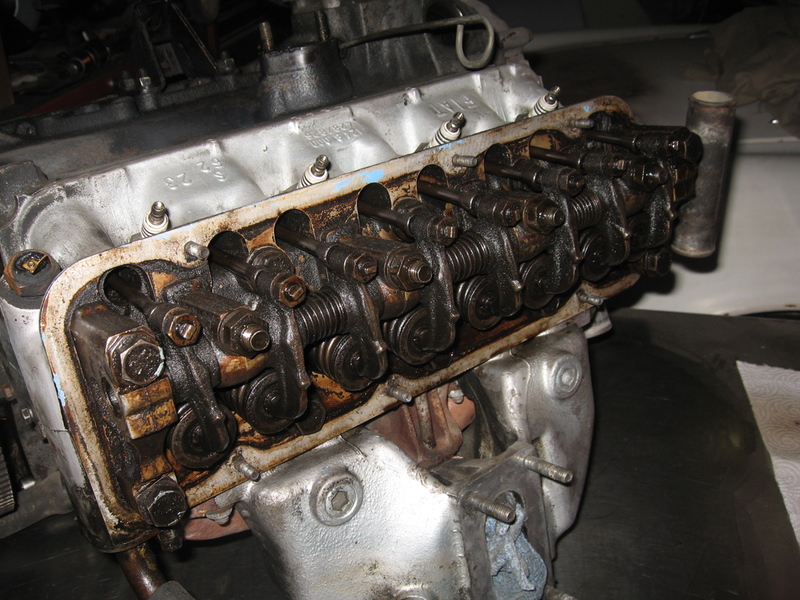 Please find herewith pictures of what I found when the Fiat’s humble engine was opened up. This had been staring me in the face since early May. Pretty grimy, but then again it is an oil and water cooled engine that gets really hot. Note how clean the outside of this engine is compared to the inside. Fiat Fresh-up part 2: who’s knocking? 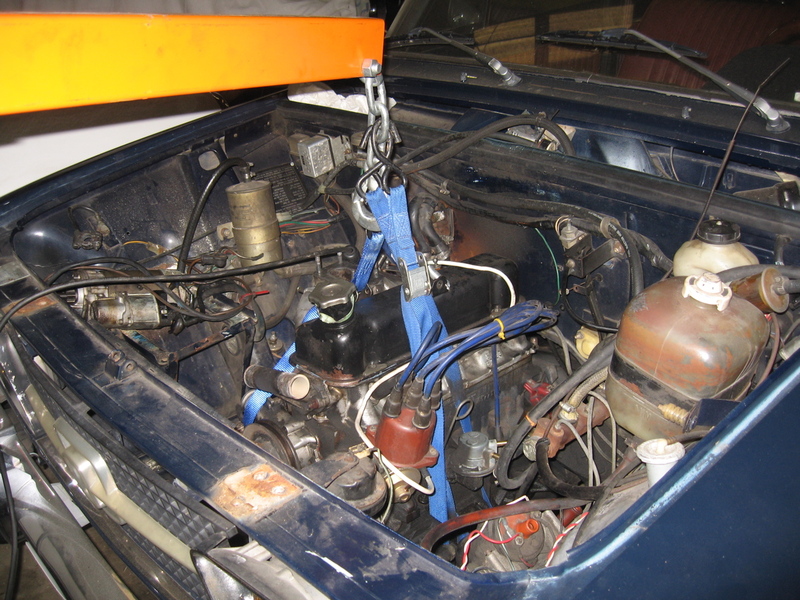 Alfa’s have a built in lift point on the head, not so FIAT’s, so I rigged up some tie-downs looped through the engine mounts. The transmission and engine are only held together by 4 bolts, but they are M12’s or something. Once everything was free I hooked up the hoist and went to work. Fiat 124 Sedan gets a freshen-up down low, part 1. One of the nicest 1972 Fiat Sedan Specials around keeping the ex-giuliettas.com Veloce company.